Anyone who says the big two can't play nice with the little guys are in for a rude awakening. BOOM! 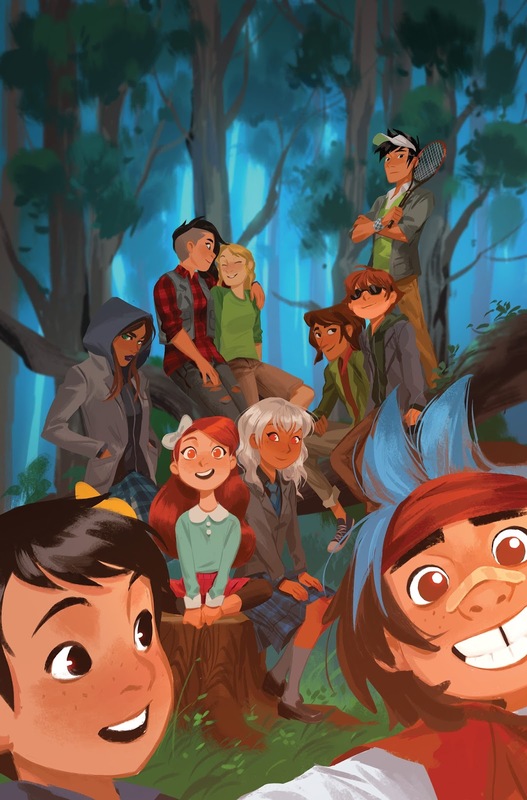 Box and DC Comics are teaming up for a Lumberjanes Gotham Academy crossover set to debut in June. The six-issue series will be written by Chynna Clugston-Flores and illustrated by Rosemary Valero-O'Connell. The main cover, revealed today, is illustrated by Mingjue Chen. The crossover marks BOOM! 's first-ever partnership with DC Comics, and also the first crossover to be produced directly by the publisher. Further details about the crossover and additional cover images will be revealed over the coming week. Full press release below. March 8, 2016 (Los Angeles, Calif.) - Today, BOOM! Box, an imprint of BOOM! Studios, and DC Comics announced a Lumberjanes Gotham Academy crossover limited series, debuting in June. The announcement was made on The Village Voice. The six-issue series will be written by Chynna Clugston-Flores (Blue Monday) and illustrated by Rosemary Valero-O'Connell (Lumberjanes). The main cover, revealed today, is illustrated by Mingjue Chen (Gotham Academy). The crossover marks BOOM! 's first-ever partnership with DC Comics, and also the first crossover to be produced directly by the publisher.